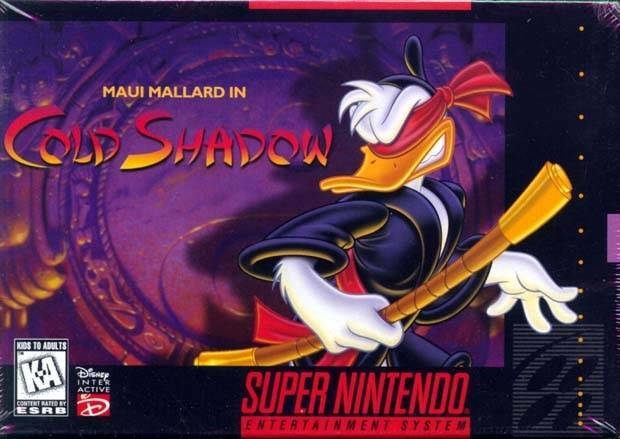 Maui Mallard Cold Shadow for Super Nintendo allows you to play as Maui Mallard as you recover the lost Shabuhm Shabuhm idol before his island paradise is destroyed. Luckily, he can transform into a Ninja to take on MudDrakes, Rotting Pirates, Duck Zombies, Amazon Warriors, and other bad tempered enemies. There are 40 hours of gameplay as Maui explores the top of a volcano, the bottom of the sea, the Realm of the Dead, and Ninja Training Grounds.